Buy us a spray of millet! If you’d like to, please feel free to buy the flock a spray of millet. Home Keet Home is a participant in the Amazon Services LLC Associates Program, an affiliate advertising program designed to provide a means for sites to earn advertising fees by advertising and linking to www.amazon.com Home Keet Home also participates in other affiliate networks, and receives small compensation if you click links or banner ads & make purchases. Home Keet Home will never endorse anything we don't believe in. I think my days of mixing together different seed blends to try and perfect our parakeet’s diet is over now that we’ve tried Dr. Harvey’s Our Best Parakeet Blend Natural Food for Parakeets, 4-Pound Bag . When we first got Toby we started out with a big bag of Kaytee foraging parakeet blend which was $8 for 5 pounds, and here we are 14 months later ending up at $26 for 4 pounds for Dr. Harvey’s! Quite an increase in price, but as it is with most things you get what you pay for. The difference between this blend and other commercial blends is easy to see, feel and smell. I swear I am fairly tempted to eat this as a snack myself. Per the product’s description the food is a “wonderful blend of nuts, fruits, seeds, vegetables, herbs and bee pollen made specifically for parakeets. This blend is so plentiful in vitamins and minerals and the appropriate amount of protein that it takes the guesswork out of feeing your parakeet”. 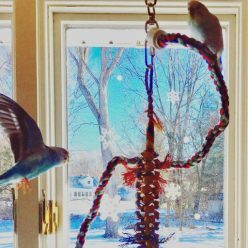 For me, knowing that I’m providing the parakeets with the best possible seed-based nutrition is totally worth the relatively high price tag. Dr. Harvey’s is also free of chemicals, dyes, preservatives and synthetic ingredients. I love that there is nothing in the mix with a color that doesn’t occur in nature. Also, although I haven’t tried it yet, I have read several reviews that the seeds are so fresh you can sprout them and feed the sprouts to your budgies. I will have to test that out and report back. I can report that our budgies mostly ignore or remove all of the larger pieces of fruit in the blend, although it we hold one out for them they will eat it from our hands they just aren’t that interested when it’s in the food bowl. So, this blend does not replace offering fresh fruit and veggies, nor should it! As you’ll see in the photos below our parakeets took to Dr. Harvey’s immediately. For now I’ve been mixing it in with my last blend because I do want to use that up, but going forward I think we’ll be a Dr. Harvey’s family. And, once I got over my sticker shock I rationalized that A. our parakeets are worth the very best and B. since we’re talking about a matter of 5 tablespoons of food per day, I think we can shoulder the financial burden! 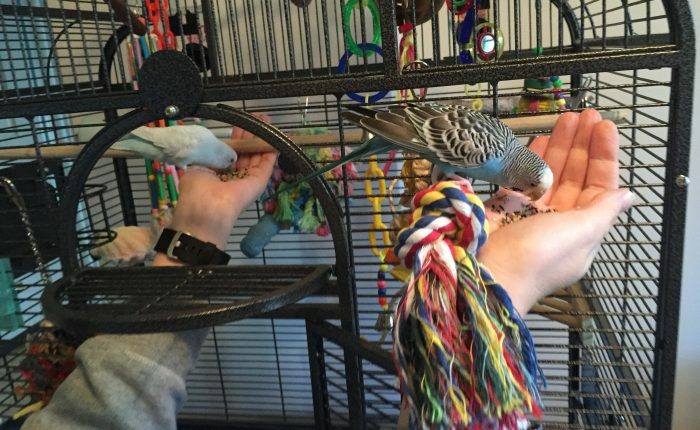 Previous Previous post: When will my parakeet let me pet him?